What is a Like-Kind Exchange & Can It Help Me Build Wealth? As business owners, Marc and I always try to make educated decisions. When it comes to taxes, it’s no different. We take great efforts to do tax planning and to implement strategies that can help reduce taxes. This in turn helps us build wealth. We work closely with our accountants to implement steps that will help us retain more profits. The private lenders who partner with us appreciate those tax savings as well. One tax strategy that can be advantageous to real estate investment companies like Simple Acquisitions is a “like-kind exchange”. A like-kind exchange is essentially what it sounds like. It’s the exchange of one investment asset for a similar asset. It also applies to investments other than real estate. However, for the purpose of this article we will focus on real estate. Keep in mind that we are neither accountants nor do we claim to know everything about a like-kind exchange. This article is for educational purposed only and we always recommend you confer with your accountants and other subject matter experts. 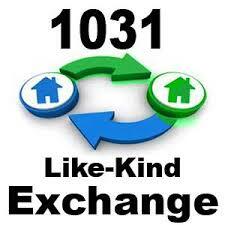 A like-kind exchange is also known as a 1031 exchange. In case you are curious as to where it got this exciting name, it’s from Section 1031 of the IRS Code. Generally, when you purchase an investment property and then sell it, there are taxes due. These are known as capital gains. These taxes eat into your profits. However, when you sell a property and you buy another at equal or greater value those taxes are deferred. The tax is still due when the replacement property is sold, however it can be deferred again if another like-kind exchange is initiated. There is no maximum number of exchanges and there’s no limit on their frequency as long as the property is held for investment for at least 1 year + 1 day. This allows your real estate investment to continue to grow tax deferred. How great is that! A “like-kind” exchange requirement does have some flexibility. What I mean by that is if you buy a multi-family property for example, you are not required to exchange it for another multi-family property. It can be exchanged for land or even a condominium, as long as the exchanged property is equal or greater to the one being sold. The “like-kind” doesn’t have to be apples to apples. As there are perks, there are also limitations. For those of you looking to invest in real estate by flipping a property, you will not be able to benefit from a 1031 exchange. This is because property specifically held for resale does not qualify. However, investors who are looking to buy and hold real estate are able to take advantage of this strategy. 1031 Exchanges have a lot of moving parts and rules. For example, the exchanged property must be identified within 45 days and the proceeds of the sale must be invested within 180 days. Another rule is Section 1031 of the IRS code requires the taxpayer listed on the property being sold to be the same taxpayer listed on the new property. There are others that I won’t go into here. The moral of this story is that it is always best to speak with your real estate accountant and a qualified intermediary should you wish to implement this like-kind exchange strategy. It can be a great way to grow your income tax- deferred. To learn more about 1031 exchanges or to find out how investing in real estate can benefit YOU, get in touch with us.